This is not a list of the best new movies I saw in 2014. If that were the case, Jean-Luc Godard’s astonishing Goodbye to Language, which I traveled to Madison, Wisconsin to see in 3D in November, would have unquestionably been number one. (Given that it is scheduled to open at the Siskel Center in January, Goodbye to Language will almost certainly be topping my list of the best films of 2015.) Instead, here are my 10 favorite new films to first play Chicago over the past calendar year, followed by a list of 40 runners up. The latest realist drama from post-New Wave French director Philippe Garrel, again starring his talented son Louis, possesses the stark beauty and simplicity of a masterful line drawing. Although the story is set in the present day, the premise is that Louis plays “Louis,” a character based on his own paternal grandfather, a struggling theatrical actor who leaves his wife, Clothilde (Rebecca Convenant), and young daughter, Charlotte (Olga Milshtein), for another woman. What goes around comes around when the other woman, the failed actress Claudia (Anna Mouglalis), cheats on Louis with another man. Louis soon descends into suicidal despair but the muted way director Garrel and cinematographer Willy Kurant (Godard’s Masculin Feminin) capture it all in dispassionate black-and-white medium shots makes the drama feel all the more heartbreaking. Garrel’s films have always felt less formulaic and more commendably life-like than the work of most other directors and, in this regard, Jealousy is one of his best and most touching achievements. Mike Leigh’s brilliant, quasi-secretive methods of constructing his unique brand of cinema — his completed screenplays apparently grow out of intensive improv-workshops with his actors — always yield spontaneous and dynamic results but there is something particularly fascinating about seeing his style applied to period pieces (as in Vera Drake, Topsy Turvy and now this); Leigh has a way of making the past feel less mummified than other directors. 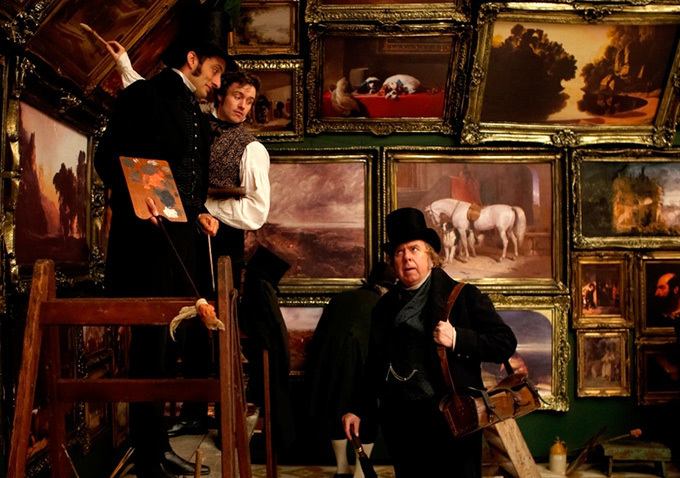 Mr. Turner is a biopic of 19th-century British painter J.M.W. Turner, a master famed for the diffused light in his seascapes, and focuses on the last couple decades of the artist’s life. Turner is inhabited by Timothy Spall, a terrific character actor with a stout physique and weak chin, who tears into his biggest movie role with aplomb — he and Leigh conceive of Turner as a larger-than-life, eccentric and self-centered prick whose face is twisted into a permanent grimace and who communicates with those around him, when at all, primarily through grunts, groans and other guttural utterances. The film essentially asks the age-old question of how an artist can be so sensitive to the beauty of nature while also being so insensitive to the people around him. 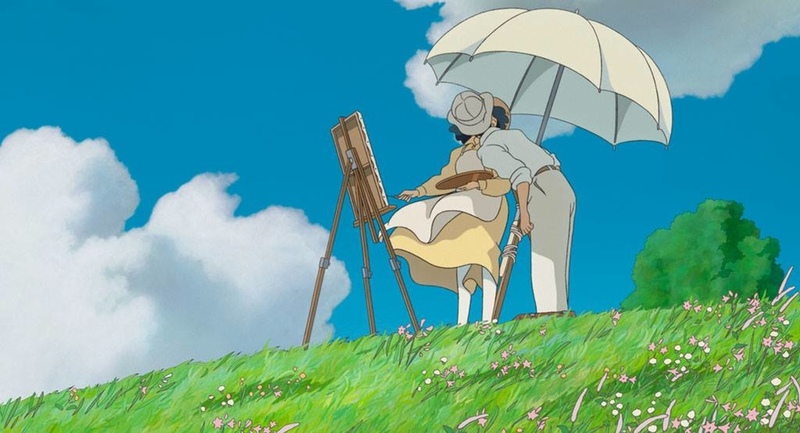 While it’s not likely that Leigh identifies with Turner in the manner of Hayao Miyazaki and the protagonist of The Wind Rises (see capsule below), this is clearly a deeply felt work through which the filmmaker does convey personal feelings — perhaps nowhere more than in the unflattering and satirical portrait of a pretentious art critic. Leigh’s stock company of actors (Karina Fernandez, Lesley Manville, Ruth Sheen, Peter Wight, etc.) turn up to do creditable work but this is Spall’s show all the way. The Babadook has racked up praise ever since its Sundance debut at the beginning of the year, although much of that has been of the “faint praise” that damns variety. This is hardly surprising given that it belongs to the still-disreputable horror genre. I have no qualms, however, about calling it a bona fide masterpiece. Not only is Aussie writer/director Jennifer Kent’s chiller highly original in conception, genuinely scary and visually striking, it’s also very beautiful as a character study. The complex dynamics of the mother-son relationship at its core — and the way this relationship is so obviously and refreshingly sketched by a female hand — has made the film continue to resonate with me over the past couple months since I first saw it. I am particularly grateful for the enormously satisfying ending in this regard; without giving anything away, please consider how the central location of a cellar might function as a Jungian metaphor for a compartment of the human mind in which the protagonist has “locked” certain thoughts and feelings away. Like all of the best monster movies, this is really about monsters from the id. Both Essie Davis (who deserves to go on to Naomi Watts-like fame) as a grief-stricken mother and Noah Wiseman as her psychologically disturbed son give incredible performances. More here. The “video essay” — you know, someone edits together clips from a bunch of different movies and then talks over them? — has become a viable and popular form of film criticism in the social media age This form was practically invented by filmmaker, critic and teacher Thom Anderson with his 2003 masterpiece Los Angeles Plays Itself, a three-hour essay that consists almost entirely of clips from movies shot in Los Angeles. The excerpts range rom the silent era through the 21st century and are organized into three roughly hour-long chapters: “The City as Background,” “The City as Character” and “The City as Subject.” The result contains fascinating and highly subjective insights into architecture, sociology and film form; one of Anderson’s key arguments is that Hollywood has never been comfortable portraying itself realistically in the present, preferring instead the revisionist past (e.g., L.A. Confidential) or the dystopian future (e.g., Blade Runner) — while minority independent filmmakers (e.g., Kent McKenzie, Charles Burnett, etc.) have, by contrast, always been up to the task. 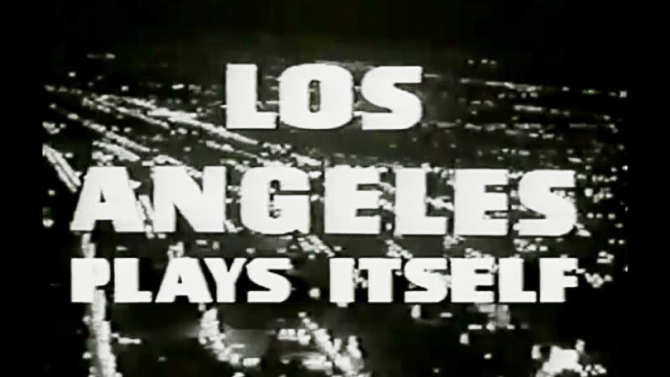 Los Angeles Plays Itself has regrettably always been hard to see do to its dubiously legal status as a potentially copyright-infringing work. After Rodney Ascher’s popular but terible Room 237 recently set a precedent for feature-length movies using clips in the name of fair use, however, Cinema Guild has finally seen fit to give Anderson’s film a proper release. Anderson has slightly re-worked it for the occasion, adding a few new clips (including, appropriately, Mulholland Drive) and upgrading most of the old ones from VHS to Blu-ray quality. The final result thankfully played around the country theatrically — including a single night at Chicago’s Music Box Theater — in advance of its official home video debut. Swiss director Ramon Zurcher’s startling first feature, alternately funny and unsettling, is one of the finest German films in recent years, as well as one of the best debut features by anyone. Confined almost entirely to a single apartment-building setting, it concerns the gathering of an extended family over the course of a single day. In my original capsule review from when it played the Siskel Center’s European Union Film Festival, I compared The Strange Little Cat favorably to Jacques Tati’s Play Time (praise from me doesn’t come much higher) in the sense that it isn’t about the characters so much as it is “really about space and time, order and chaos, images and sounds, and the relationships between people and objects. Everything seems precisely choreographed yet elements of chance undoubtedly come into play, especially where the family’s cat and dog (the ultimate non-actors) are concerned.” This film is so charming, so weird, so self-assured; I can’t wait to see what Zurcher, a former student of the great Bela Tarr, comes up with next. More here. Out of all the great new films I saw in 2014, none felt quite as vitally contemporary as this incredible true story of a group of radical Muslim terrorists taking over the title city in Mali. There are several deftly interleaved story threads here, all of which concern ordinary Malian citizens living under the yoke of a frightening new theocracy, and all of which manage to protest the insanity of religious extremism within a dramatic framework that feels completely naturalistic. Timbuktu also contains a vain of absurdist humor that rings bizarrely true, as in a scene where a group of jihadists debate the merits of their favorite soccer stars. Finally, writer/director Abderrahmane Sissako (Bamako) brings a real sense of visual poetry to his ‘Scope compositions; his feel for the desert landscapes of western Africa is as evocative here as John Ford’s was in his great late westerns. It is this effortless combination of docudrama and lyricism that ultimately lifts Timbuktu into the status of the transcendent. More here. “We are at that point where no one owns history anymore. We make up our own histories.” The title of Norte, the End of History comes from these lines of dialogue, spoken during a philosophical rap session by a group of Filipino law students. One of them, Fabian (Sid Lucero), a recent college dropout, will soon commit a horrific double murder for no good reason. Writer/director Lav Diaz takes this premise from Fyodor Dostoevsky’s Crime and Punishment but puts it to the service of very different ends; I think he mostly wants to show how, over time, Fabian becomes increasingly tormented from within as a result of his actions, even while going unpunished by the law. Conversely, Joaquin (Archie Alemania), the family man who is unjustly charged with the crimes, not only retains but amplifies his original compassionate nature even after spending years in prison. This masterpiece, which at four hours and 15 minutes is actually Diaz’s shortest film to date, is also the first to receive distribution in the United States. One can only hope that Cinema Guild’s release will open the door to more of his works turning up on these shores in the future. More here. Richard Linklater delivered his magnum opus with this 12-years-in-the-making intimate epic about one Texas boy’s life from the ages of six to 18. 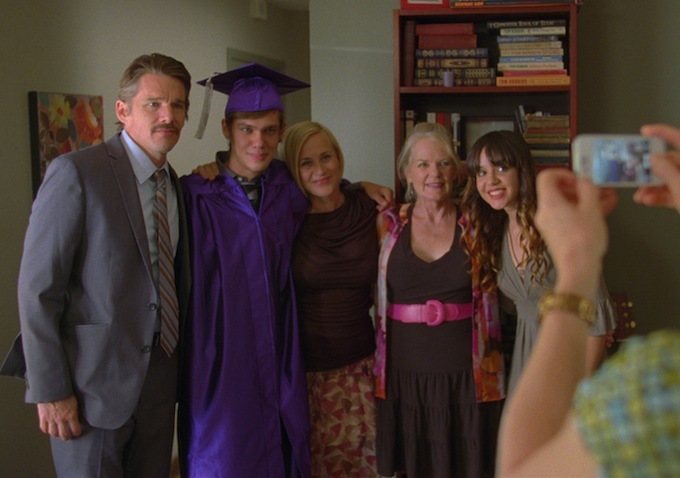 No mere gimmick, Linklater’s strategy of shooting an average of just 3-to-4 days per year has resulted in a profound meditation on the concept of time, as viewers are asked to observe not only the protagonist (Ellar Coltrane) grow and change over the years but also the actors playing his sister (Lorelei Linklater) and parents (Ethan Hawke and Patricia Arquette) — and are consequently invited to think about the passage of time in their own lives in the process. Linklater’s masterstroke was his decision to de-dramatize the material; many younger filmmakers could learn a thing or two from this film’s lack of external, dramatic action. In place of “plot,” he serves up a series of low-key but universally relatable scenes that movingly capture the essence of what it means to “grow up” in 2 hours and 46 minutes. Or, as Ethan Hawke put it in a recent interview, “What (Linklater)’s saying is that life doesn’t have to be hyperbolized. What we actually experience is good enough.” As always with this Linklater, there’s a great deal of humor and heart, but the film’s ingenious central conceit pushes Boyhood into the realm of a game-changer. Full review here. 11. 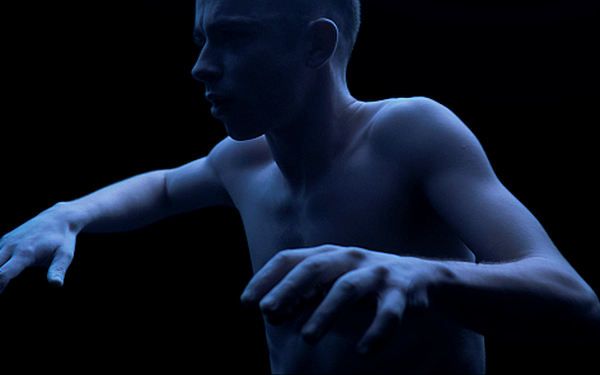 A Spell to Ward Off the Darkness (Rivers/Russell, Estonia) – European Union Film Festival. Rating: 9.1. More here. 13. Nymphomaniac Vol. 1/Vol. 2 (Von Trier, Denmark/Germany/UK) – Landmark. Rating: 9.0. Full review here. 14. Winter Sleep (Ceylan, Turkey) – Chicago International Film Festival. Rating: 8.8. More here. 16. The Blue Room (Amalric, France) – Siskel Center. Rating: 8.7. More here. 17. Force Majeure (Ostlund, Sweden) – Chicago International Film Festival. Rating: 8.7. More here. 18. Jimmy P. (Desplechin, France/USA) – Facets. Rating: 8.6. More here. 19. Journey to the West (Tsai, France/Taiwan) – VOD. Rating: 8.6. More here. 20. Gloria (Lelio, Chile) – Landmark. Rating: 8.6. Full review here. 21. Clouds of Sils Maria (Assayas, France) – Chicago International Film Festival. Rating: 8.5. Full review here. 22. Bird People (Ferran, France) – Siskel Center. Rating: 8.5. More here. 23. The Grand Budapest Hotel (Anderson, USA/Germany) – Wide Release. Rating: 8.4. Full review here. 24. The Iron Ministry (Sniadecki, USA/China) – Chicago International Film Festival. Rating: 8.4. More here. Filmmaker interview here. 25. Snowpiercer (Bong, South Korea) – Music Box. Rating: 8.4. Full review here. 29. Pretty Butterflies (Mereu, Italy) – European Union Film Festival. Rating: 8.3. More here. 31. Land Ho! (Katz/Stephens, USA/Iceland) – Music Box. Rating: 8.3. More here. 34. Manakamana (Spray/Velez, Nepal/USA) – Siskel Center. Rating: 8.1. More here. 36. Of Horses and Men (Erlingsson, Iceland) – Chicago International Film Festival. Rating: 8.0. More here. 37. Top Five (Rock, USA) – Wide Release. Rating: 8.0. More here. 38. Miss Julie (Ullmann, Norway/Ireland) – Chicago International Film Festival. Rating: 8.0. More here. Filmmaker interview here here. 39. Metalhead (Bragason, Iceland) – Chicago International Movies and Music Festival. Rating: 8.0. More here. 40. The Longest Distance (Pinto, Venezuela) – Chicago Latino Film Festival. Rating: 8.0. More here. 44. The World of Goopi and Bagha (Ranade, India) – Chicago International Movies and Music Festival. Rating: 7.9. More here. 45. Anina (Soderguit, Uruguay) – Chicago Latino Film Festival. Rating: 7.9. More here. 46. All the Women (Barrioso, Spain) – Chicago Latino Film Festival. Rating: 7.8. More here. Filmmaker here..
49. It Follows (Mitchell, USA) – Chicago International Film Festival. Rating: 7.6. More here.